The first new album in 24 years from legendary Heartbreakers guitarist/vocalist Walter Lure. The lead off track “Crazy Kids” will be featured in a full-length film Thunders: Room 37, which dramatizes the final days of Lure’s former bandmate, Johnny Thunders. Joe Whyte interviewed Waldo for Louder Than War online in 2017 and it stands as one of the very best pieces ever published on this website. He descibed the man thus: “With more lives than a cat with a lucky charm, Walter Lure survived not only the NYC punk scene, but also the Anarchy Tour and being in The Heartbreakers, possibly the most self-destructive, contrary band of them all”. Read the whole thing to get the full story… cos this review aint a comprehensive history lesson. Nor is it unbiased or objective either, it’s just a Waaaaaaah-Hooooo! heads-up from a fan to let other fans know that this is a great piece of work. Perhaps the final piece of the Dolls/Thunders/Heartbreakers jigsaw puzzle. It’s the sound of the Last Man Standing having fun, going back to his roots, doing what he does best and staking his claim for being remembered as being just as important as his compadres. This album from the title thereon-in is just full of 1950’s rock’n’roll influences; Where Were You (On Our Wedding Day), Wham Bam Boo, Bye Bye Baby, Little Black Book – the titles say it all. You wouldn’t be surprised if the Fonz and Richie Cunningham popped up on a track. Its more Lindy Hop Doo-Wop than Punk Rock in places. There is some great honkin mouth-organ and sax playing and girly-backing-vocals. Take A Chance With Me is more Rock’n’Rollified than the ramalama Heartbreakers version. A re-made London Boys is just so joyful when it was previously a malevolent piece of snidery. What they lack in Thunders slip-shod but spot-on playing and slurred delivery, the Waldos make up for in sheer skill and enthusiasm. They just sound right. Not over-rehearsed or too slick. Not using modern studio-trickery. And not trying to be Johnny. In places it actually sounds more New York Dolls than Heartbreakers, (Don’t Mess With Cupid was covered by the Dolls before the Waldos got hold of it) and even the slightly more pedestrian moments sound like latter-period Ramones (which is a good thing, some of those albums were fabulous). Walter must be knocking on a bit and he doesn’t seem to remove his hat much so I’m guessing the thatch is thin, but he can still rock and play as well as ever. I guess he was the solid, reliable mainstay of the Heartbreakers and he does their musical legacy proud with this unpretentious, old-school collection of songs, played with love, fire and precision. 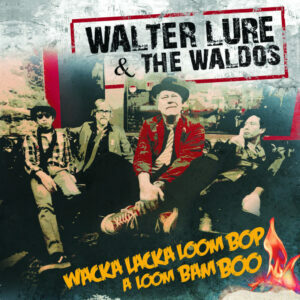 God Bless Walter and the Waldos: Wacka Lacka Boom Bop A Loom Bam Boo is a great album: pure rock’n’roll and pure unadulterated fun. Today Walter Lure & The Waldos is Walter Lure (guitar and vocals), along with Takanori Ichiuji (bass and vocals), Tak Nakai a.k.a. Takto (guitar and vocals), and Joe Rizzo (drums and vocals). On September 6, Walter Lure & The Waldos will hold their record release party at Bowery Electric in New York.